Before there was YouTube, there was Itche Kadoozy. The wonderfully wacky web video series features a cast of puppets that includes a gray-bearded rabbi, a dysfunctional but lovable college student, and a talking gefilte fish. The series was released on Chabad.org in 2004 and continues to entertain and educate children and adults around the world. “Back then, even before YouTube, the internet created the opportunity to share video with the world,” says Rabbi Dovid Taub who produced the shows with his friend Jonathan Goorvich for Chabad.org, “but there was really very little quality Jewish video content out there. We had this great idea, we made the videos, and people would email them to their friends and that was how they were passed around,” he explains. As the show gained a faithful audience and evolved, the cast grew to include a fictitious lawyer named Larry Goldstein (who ends every statement with a open-mouthed “Ha!”), some friendly monsters, and a slew of other zany but instantly memorable characters. For example, in “Jono and the Whale” Jono wins a pet whale in a sweepstakes after purchasing 75 magazines he did not need (he could not resist because he was “pre-selected as a winner”). After arguing over whether bajillion and bazillion were proper numbers, Jono and the rabbi discover that the whale—too big for even six bathtubs—was being shipped to them in a “very large” cardboard box. Jono soon learns that a whale needs more water than could be provided by a 24-pack of spring-water bottles. The lesson: Jews need to be immersed in Torah, which is compared to water, on a constant basis. The show concludes with Larry Goldstein being inspired by the rabbi’s lesson and volunteering to arrange to ship the whale back to the aquarium. Starting in a miniscule conference-room-turned-studio in the Chabad.org offices in Brooklyn, N.Y., the filming and editing progressed along with the technological advances of the era, as did the facilities. Yet, the nonstop laughs and intermittent Jewish teachings remained a constant. The article went on to explain that the disparate characters of Itche and Jono allow every Jew to see some of themselves in the show and relate to its message. Coming full circle, the scripts and select images from many of the most popular episodes of the show are now being released in the form of an oversized, soft-cover 408-page book. Over the past few years, the Chabad.org team has been adding closed captions to many of the videos, making them accessible to even more people. Goldstein explains that the book, which includes many of the show’s most beloved episodes, is perfect reading for all ages, especially on long, summer Shabbat afternoons, when computers and similar devices are off-limits by Jewish law. He explains that the book can also be used in the classroom and in camps, with children taking turns acting out the various characters using the scripts in the book as their guide. Goldstein was able to assemble some parts of the book from scraps of original scripts that Taub stored away years ago and resurrected from ancient hard-drives. But the majority had to be painstakingly transcribed from the actual videos. The book also contains some historical photos and background information that will be of special interest to Itche aficionados. 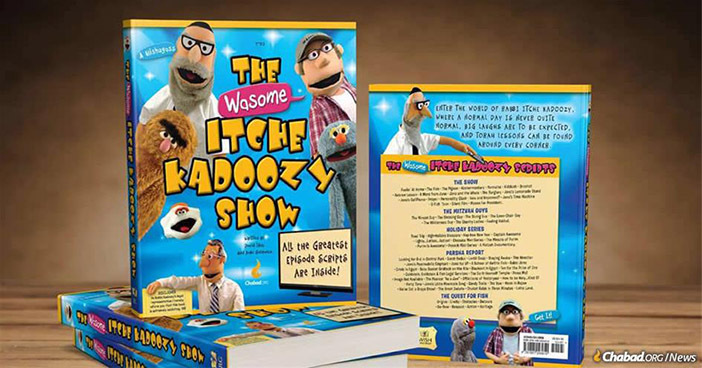 The Itche Kadoozy Show (softcover; 8.25 x 9.5; ISBN 9781891293610; 408 pages; $24.95) book is published by the Jewish Learning Group and distributed by Feldheim Publishers. Available at Jewish bookstores and online at: www.JewishLearningGroup.com.